Ideal for easily terminating Cat5e Stranded Ethernet Network Cable to any length you want. Ideal for easily terminating Cat5e Solid Ethernet Network Cable to any length you want. Ideal for easily terminating Cat6 Solid Ethernet Network Cable to any length you want. Inserter or Load Bar: The inserter or load bar allows for easier alignment and checking of wiring schemes. It also helps as a guide to provide a straighter cut. The guides are staggered to keep the twist tighter and keep the crimp closer to specs. 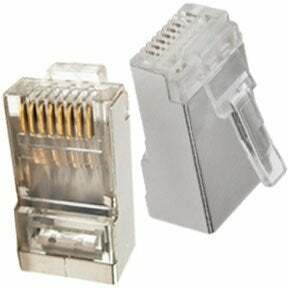 You can choose from RJ45 Cat 5E plug stranded 2 prong, RJ45 Cat 5E plug solid, RJ45 Cat 6 plug stranded, RJ45 Cat 6 plug stranded , UTP toolless keystone plugs, round stranded plugs shielded, flat plugs stranded, round solid shielded plugs, modular plugs, plug stranded wires, and many other products. All of them are available with different specifications. We offer our products at very competitive prices without compromising on their quality. All our products are sourced from ISO 9001-2000 registered manufacturers and RoHS compliant as well.